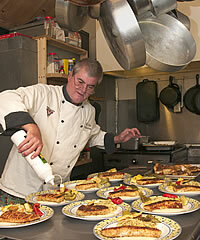 We employ a world-class, gourmet chef with years of experience. The meals we prepare are simply incredible and take our guests on delicious culinary adventures! The day begins with a full breakfast, then later a great lunch at the lodge or a packed lunch on the river. Sunny days inspire a shore lunch, cooked over an open fire right on the bank of the Tsiu River. After a full day of fishing, you will be treated to delicious hor d'oeuvres before dinner, served in our observation lounge where you can look out over the vast Bering Glacier and the magnificent Chugach Mountain Range. This is the perfect setting to reflect on the day. You will be in awe of Alaska's natural beauty, viewed from this peaceful contemporary space. Our dinners are truly memorable with entrees such as Beef Wellington, Hot & Crunchy Halibut with Mango Salsa, Fresh-Caught Baked Silver Salmon with Sesame-Ginger Sauce, Rack of Lamb, Alaskan Scallops, Stuffed Pork Tenderloin, thick aged Black Angus Grilled Beef Steaks. Included with each dinner are vegetable dishes, fresh baked bread, rice, potatoes or pasta, and a fresh homemade dessert such as fruit tarts, hazelnut chocolate cake, créme bruleé, and others. You won't go hungry! For those with dietary restrictions, we are happy to prepare delicious alternative dishes. Our commercial kitchen features state-of-the-art commercial stove, grill and fryer, stainless steel fixtures and work surfaces, a tile floor, walk-in coolers and deep freezers insure the highest quality food. Our kitchen is fully approved and in compliance with all Alaska Department of Environmental Conservation's Public Restaurant Codes and Regulations. Our water well produces delicious clean water and is a State approved Class "C" public water system.